Note – This is the 3rd, and last, part of my 10-bit experiment. I will probably be encoding Shana and Eden Movie II in 8-bit, and then starting in September begin transitioning to 10-bit in full. Added support for decoding H.264 10-bit 4:2:0 and 4:4:4.
can you tell me how to play 10bit video with another program than mpc , it doesn’t work on my computer when it’s in 1080p or the 8 bit does . do you know anything to resolve this matter ? I’m using CCCP and unchecked AC3 Encode output and the FLAC audio worked fine. @Anonymous: try the betas of CCCP which is here http://www.cccp-project.net/beta. I agree-what’s the point of using 10 bit encoding? It won’t play on my media player-the small amount of advantage gained is more than offset by the major problems it will cause. Thanks 🙂 – So, you did this movie as your 3rd and Bakemonogatari as your 2nd, in Hi10p… but I can’t figure out which was your first. I keep looking at older posts and can’t find it. I see that Whisper of the Heart has 5.1 FLAC audio, but how can I send these 6 channels to Onkyo TX-NR 3007 receiver via AMD Radeon HDMI. It seems that I get better sound from 5.1 DTS English than 5.1 FLAC Japanese via HDMI. I can view Hi10 perfectly with MPC-HC. Should I keep trying with 5.1 FLAC or try to transfor via filter to 5.1 DTS Japanese sound. My Onkyo can decode DTS 5.1 , FLAC (stereo), PCM 7.1 via HDMI. AMD Radeon HDMI on Win7-32bit can send audio in 2, 4, 5.1 and 7.1 via Radeon HDMI. The best I got from 5.1 FLAC is 1. Set Radeon HDMI to deliver 7.1 audio, 2. Onkyo receiver accepts 7.1 PCM but actual sounds from some channels are missing (i.e., rear and side channels). I think I should try to send either 5.1 FLAC via HDMI or transform to 5.1 DTS via HDMI. Can somebody help me here? Thanks. To ChrisK: – It seems to work. Thanks so much. Sounds so much better now on 5.1 FLAC. For the life of me, I can’t seem to get subtitles working for this. Every other anime with embedded fonts works without issue. Went through about a dozen different shows and all of them work without issue. When trying to play the 1080p version ([7FD2591F]), the only way I can get subtitles is to enable the “Default Style”. 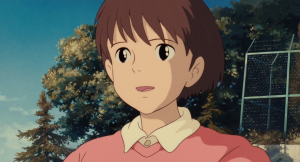 The only subtitle line that shows up is the “Whisper of the Heart” under the title. it seems to have automagically fixed itself after i went to sleep. is the 720p also encoded in Hi10P ? Thanks for all the great work! I really enjoy your releases, especially since you include the alternate language tracks, which is great help for those of us studying other languages 🙂 Which brings me to a quick question: is there any chance that you could release the subtitle files for the Chinese and Japanese tracks as well? Can you please seed the 720p version its at 2kb/s right now. Hi CG! Thanks for all the Ghibli movies in HD ^^ it’s so difficult to find such awesome quality with cantonese dubs. Hope to see more xD Thanks!! How to download..I don’t how to download this file..
Can we get some seeds for 720p?